At age 90, Liliane Bettencourt is the world's richest woman, and returns to the top ten wealthiest for the first time since 1999. She and her family own more than 30% of L'Oreal, which her father founded. They've gotten far richer this year, thanks to a boost in the French cosmetics powerhouse's stock. However she had her fortune placed under the guardianship of her daughter Francoise Bettencourt-Meyers in 2011 following a very public three-year legal battle. The elderly widow, who suffers from dementia, was replaced on the company's board by her 25-year-old grandson Jean-Victor Meyers in February 2012. 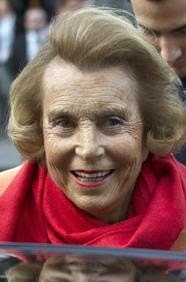 Kudos to Liliane Bettencourt for becoming this site Entrepreneur of the week. Thanks for Reading.